After more than three years of preparation, waiting and chasing, a NASA probe is now just days away from its Valentine's Day date with a comet. The Stardust-NExT spacecraft will fly to within 124 miles (200 kilometers) of comet Tempel 1 at about 11:40 p.m. EST on the night of Feb. 14 (0440 GMT on Feb. 15). 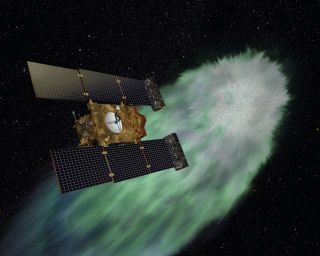 The main goal is to see how much Tempel 1 has changed since July 2005, when NASA's Deep Impact probe flew by the icy wanderer and sent an impactor smashing into it. "The primary purpose is to observe how the comet has changed, how the nucleus has changed, to compare to what it was like back in 2005," said Stardust-NExT project manager Tim Larson, of NASA's Jet Propulsion Laboratory in Pasadena, Calif., in a recent NASA video. The Stardust-NExT probe began its life as the Stardust spacecraft, which launched in February 1999. It accomplished its primary mission — to collect dust and gas from around comet Wild 2 and send the sample back to Earth in a return canister — in 2006. Since the spacecraft was in good shape and had enough fuel, NASA gave it a new mission in July 2007: to meet up with comet Tempel 1. With the new mission came an expanded name: Stardust-NExT (for "New Exploration of Tempel"). The 3.7-mile-wide (6 km) comet completes an orbit every 5 1/2 years, so it has circled the sun once since Deep Impact's visit. Researchers hope Stardust-NExT will give them an idea of how Tempel 1 has changed during this time. Another goal is to map out more of Tempel 1's surface, adding to the work done by Deep Impact. Through making these and other observations, Stardust-NExT can contribute to scientists' understanding of how comets formed at the solar system's birth 4.6 billion years ago and how they have evolved since then, researchers have said. Stardust-NExT has already logged about 3.5 billion miles (5.7 billion km) in space, researchers said, and it will put a few more on its odometer before calling it quits. On the night of Feb. 14, the spacecraft — traveling at about 24,300 mph (39,100 kph) — will fly close to within 124 miles (200 km) of Tempel 1. Stardust-NExT will take 72 high-resolution images during the flyby and begin transmitting them to Earth about an hour after the closest approach, researchers said. This should be the last comet encounter for Stardust-NExT. It will burn up almost all of its remaining fuel chasing down Tempel 1. But it should go out on a high note, researchers said. "The spacecraft is working wonderfully well," Stardust-NExT principal investigator Joe Veverka, of Cornell University, told reporters last month. "The science team is awfully excited and can't wait to see all the pictures."